Hong Kong-based architects OVA Studio designed Hive-Inn, a wild-looking concept hotel made from colorful shipping containers. 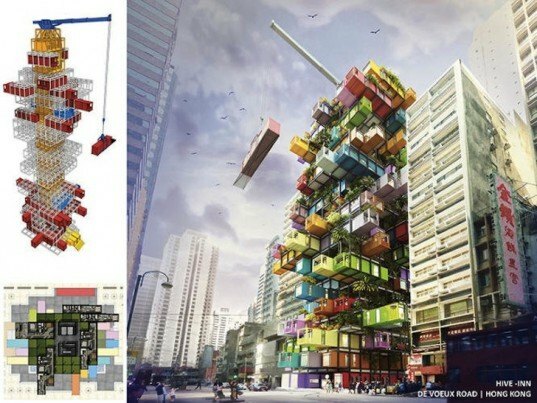 Designed as a submission for the Radical Innovation Awards Competition 2014, the bold Jenga-like structure is made of pieces that can be swapped out depending on the hotel's needs. 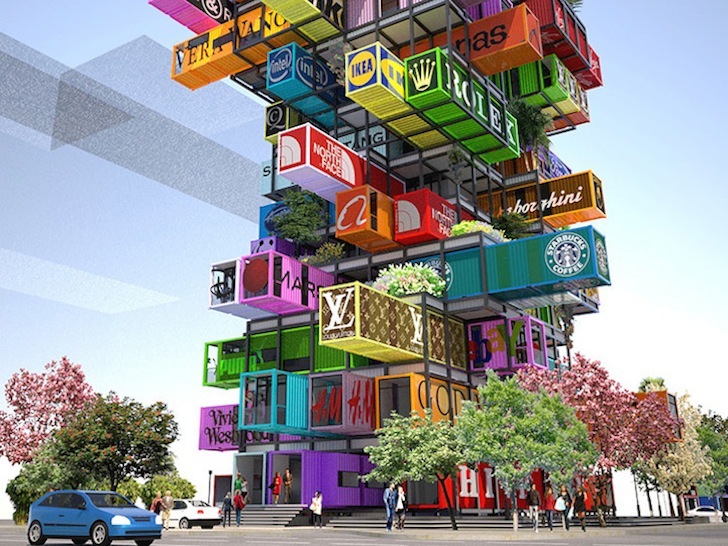 Each shipping container is themed in the style of a famous international brand, from Ferrari to Louis Vuitton, to give hotel guests the opportunity to build a closer bond with their favorite trademark name. Just like the game Jenga, the shipping containers can be inserted or taken out of the stacked and staggered tower with ease. A metal grid structure, however, would ensure that unlike Jenga, the tower would not topple over. The flexibility and mobility of the design also presents an interesting and highly visual branding opportunity, in which major brands, such as Ferrari, can sponsor the design and development of a differently themed shipping container hotel room. The Hive-Inn could then generate brand buzz by advertising limited edition shipping container rooms that would travel from city to city. In addition to expanding the market to brand followers, the architects also envision other uses for the Jenga-like cargotecture concept. Once a shipping container is cycled out of the design, the container could then be shipped out and used in disaster relief scenarios. Guests could also purchase the shipping containers as mobile apartments and offices. This is very interesting. However, my interest in particular lies in the design and implementation of a standard HVAC/power/sewage/water interface that would markedly enhance the portability aspect. Just like the game Jenga, the shipping containers can be inserted or taken out of the stacked and staggered tower with ease. A metal grid structure, however, would ensure that unlike Jenga, the tower would not topple over. The flexibility and mobility of the design also presents an interesting and highly visual branding opportunity, in which major brands, such as Ferrari, can sponsor the design and development of a differently themed shipping container hotel room. The Hive-Inn could then generate brand buzz by advertising limited edition shipping container rooms that would travel from city to city. Once a shipping container is cycled out of the design, the container could then be shipped out and used in disaster relief scenarios. Guests could also purchase the shipping containers as mobile apartments and offices.